Tattoo Survival Serum is the world’s first cosmeceutical for tattooed skin. This deluxe creamy serum contains color protecting CPX Complex with Heliogenol™ for more vibrant and longer-lasting ink color. 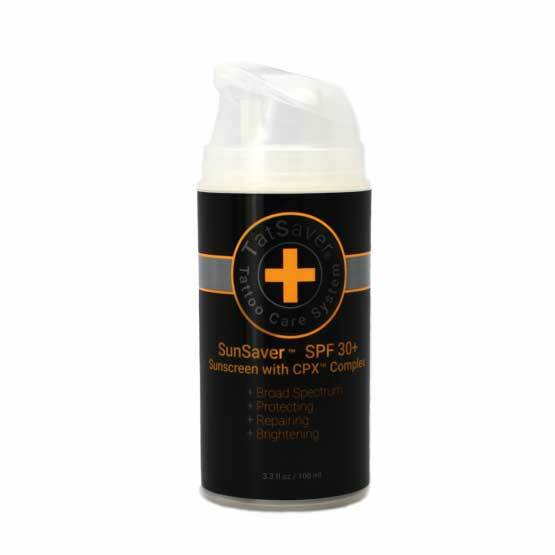 Helps to protect and restore dull and fading tattoos, and maintain ink color below the skin, unlike sunscreen, which only protects on the surface of the skin. Formulated with peptides and stem cell extracts from Bamboo, Green Tea, Ginseng and Mung Bean to help maintain skin firmness and elasticity. Vitamins A, C and E and Glycerin moisturize and heal to smooth skin. Pomegranate antioxidants provide superior protection against UV-induced free radicals and environmental stress like smoke and pollution. Protect your investment in body art or permanent make-up with TatSaver Tattoo Care system. This lightweight, oil free serum won’t stain clothes or bedding.